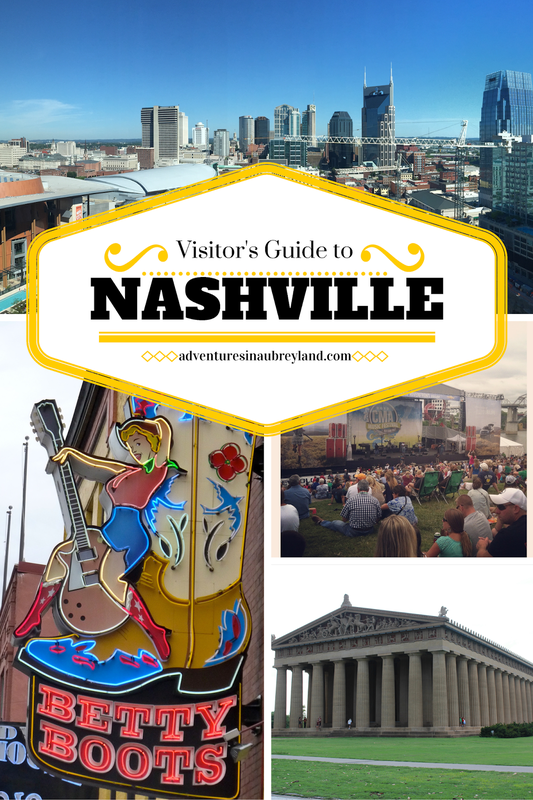 Since I've lived in the Nashville area, the past few years, I get a lot of folks who ask for my recommendations on what to see, do, and eat when they're in town. I usually draft up a list off the top of my head, but my friend Krista made a list on her blog recently that inspired me to do the same! Eat HOT CHICKEN. This is what Nashville is famous for, not BBQ or anything like that. I haven't been to the original, Prince's Hot Chicken, but I really love Hattie B's. Both serve varying levels of spiciness. The west side location of Hattie B's has less of a line and free parking, if you want to avoid the crowds. Because when it's about hot chicken, there are lines. That said, it's on the menu at lots of local spots, and if it's classic then it's served with pickles on white bread. Eat Southern food. Especially if it's not prevalent where you live. Try one of the Puckett's locations for a sure bet, where you can often enjoy some live music too. Two classics still on my list to try? Monell's and Arnold's Country Kitchen. For BBQ, hit up Edley's Bar-B-Que, in either of it's locations. For fancy Southern, get a reservation for Husk, Sean Brock's SoBro spot. Or try The Southern downtown. And if you see a sign that says "Meat & Three", what that means is you pick one of the daily main "meats" or dishes, then pick three sides... or two, or whatever floats your boat. Eat brunch. In the Gulch, try Biscuit Love Brunch and order their "bonuts", which are biscuit donuts. Yes, they're as amazing as they sound. The Copper Kettle has a great buffet of the beaten tourist path, or you can tuck in for the buffet in the heart of downtown at Kitchen Notes. Or, venture into the country for the classic Loveless Cafe. No matter where you go for brunch (except Kitchen Notes, which takes reservations), go early or be prepared to wait in LONG lines. I still haven't made it to Marché Artisan Foods (or Margot, for that matter) for brunch in East Nashville. Goals, people! Eat fancy. For steak, Kayne Prime. For sushi and fusion, Virago. For Italian, Moto. And they're all on the same street! If you're craving an upscale, delicious cocktail, The Patterson House is an unmarked Prohibition-style spot that fills up fast, but its pricey mixed drinks are worthwhile! If you're craving some staples... get burgers at Burger Republic, pizza at DeSano Pizza Bakery, and people tell me Rosepepper Cantina is good for Mexican fusion. Favorite food truck: The Grilled Cheeserie. Asian food isn't Nashville's strong suit, but there are ramen places popping up so I hope that is the next trend! If you feel like browsing, here's my blog rollup of Nashville food posts, or check out my reviews on Yelp! We love Cheekwood Botanical Garden and Museum of Art. There are always new exhibits passing through, including big outdoor installations. You can experience a bit of history at The Hermitage, the home of Andrew Jackson. It's an impressive, well-preserved estate. I went with my family and it was a good spot! 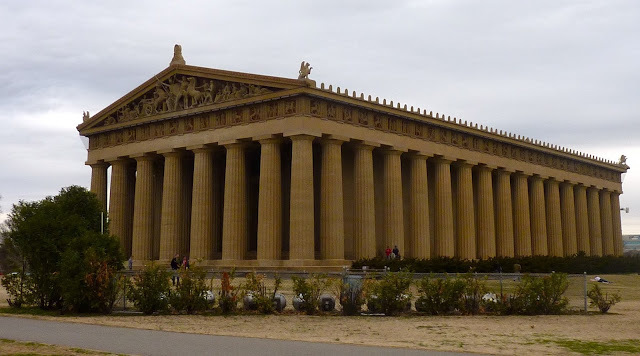 Check out a replica of The Parthenon, with a small art museum, in Centennial Park. I hear the Frist Center for the Visual Arts is wonderful, so it's on my list for sure! I could have listed The Country Music Hall of Fame as a museum, but it's part of the overall music experience. It's pricey but very nice, and they have moved Hatch Show Print under the same roof which is another classic. There's also now a Johnny Cash Museum downtown too. If you want to hear live music, there's TONS everywhere. Just walk up and down Broadway! I enjoy catching some music at Acme Feed & Seed. If you plan ahead, you can catch some great concerts. Bridgestone Arena has tons (as well as hockey games for the Nashville Predators), but my favorite venue is Ryman Auditorium. You can tour the Ryman when there aren't events. CMA Fest and other events also bring people to town, and if you don't mind the crowds, they're pretty fun! I recommend buying tickets a year in advance though, because it's a big event for tourists and out-of-towners to come into the city. In general, there are some great restaurants and boutiques in a few different neighborhoods in Nashville... 12 South, The Gulch, East Nashville, Germantown, and Hillsboro Village to name a few! It's a town of many small enclaves and pockets, so you definitely have a lot to explore. There are so many places, you could spend weeks here and not feel satisfied. I've been here over three years, and there are still a ton of places we need to go! And I haven't even touched on Franklin (where I live) or the surrounding areas yet... I'll save that for another guide, another post. What are your favorite places in Nashville?